In her infamous first sentence of The Journalist and the Murderer, Janet Malcolm swings for the fences and proclaims that "every journalist who is not too stupid or too full of himself to notice what is going on knows that what he does is morally indefensible." She means that journalists use their human subjects and then dispose of them; that we con them in person by "preying on people's vanity, ignorance, or loneliness"--it occurs to me to note that however bleak print's future seems, journalism will at least never run out of material--before gutting them in print. This was a provocative thought in 1990, in those years of innocence before the Internet turned the guttings into a spectator sport. Malcolm was writing about a certain kind of journalism, and she was writing about murder: specifically, the case of the journalist Joe McGinniss's coverage of the murder trial of Jeffrey MacDonald, accused in 1970 (subsequently convicted, released, and re-imprisoned, where he stews today) of murdering his wife and daughters. Her basic criticism of McGinniss--that he cozied up to, and misled, MacDonald's defense team before producing a book that judged him guilty; and that he did so because he "found out too late … that the subject of his book was not up to scratch" as an interesting character--still stands as a useful indictment of journalists in those kinds of situations, especially when the scent of movie money hangs in the air. But what about politics? Politics is different. In politics no one dies, usually; although, perhaps paradoxically, millions do, but it's not the same thing. And while there can be money in political journalism--sometimes very surprising injections of it, as we will see below--there isn't any really big money. Politicians, as subjects, are inherently interesting. Even when they are quite boring on a personal level (dirty secret: many of them are! ), and even when their handlers tamp any remotely interesting human trait out of them for the sake of not offending some focus group, they are still interesting, because of the power they hold and the ways they use it. And in political journalism--this is important to remember--both sides are in on the con, so it all comes out in the wash.
Malcolm's statement, then, is far too broad. All journalism--let's say all urgent and serious journalism, so as to toss out coverage of last night's zoning-board meeting and Britney's latest breakdown and so forth--is not a morally indefensible con game. If one great claim may be made on behalf of The Clinton Tapes, it is that the book is not only morally defensible, but even (if one is basically sympathetic to Clinton, as I am) is good and useful and in places admirable. Taylor Branch performs a service in these pages. He reaches an audacious conclusion--that Clinton, through all the turmoil and scandal and pseudo-scandal, remained "consistently more candid and idealistic than my colleagues covering him for the press." We have been swimming in an ocean of journalism for the last fifteen years making precisely the opposite claims about Clinton, some of which of course have a basis in some of his actions, and so Branch's view is useful to have, and is more or less persuasive. Even so, an odd quality floats through these pages--a withholding of journalistic assessment, a reluctance about getting to the bottom of things, an excessive identification with the subject, an offhandedness even--that often left me spellbound by the details but still in some way skeptical about Branch's project, and grabbing for its big narrative hook. All this gives the reader the odd feeling of leaving the dinner table stuffed but still undernourished. I finished The Clinton Tapes, very much to my surprise, with fewer questions for Clinton than for Branch. In a somewhat obligatory fashion, the book opens with the first of their seventy-nine sessions, which took place on October 14, 1993. (Their meetings ran right up through January 2001, and straggled on as late as 2004.) But it is in the second chapter that Branch, the great historian of the civil rights movement whose work few contemporary journalists have equaled, describes how the project got started. A few days after the election in 1992, Branch read in his hometown paper, The Baltimore Sun, a quotation from Clinton, who had heard that Branch was in Little Rock on the night of the big victory celebration and expressed regret at having missed him. 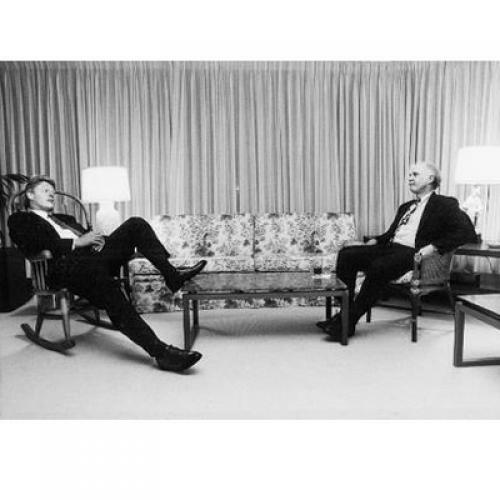 Branch and Clinton--both Clintons, actually--had worked and even lived together on the McGovern campaign in Texas. But they had split soon thereafter to pursue truth and justice in their different ways, and had fallen out of touch. Shortly after Thanksgiving, Branch's phone rang: a transition official wanted to know if he and his wife could come down to Washington to see the president-elect. Clinton got the Branches plum seats at the inauguration and an invitation to a dinner hosted by Katharine Graham. Branch was asked to draft language for the first State of the Union speech. Clinton said he wanted an in-house historian, his own Schlesinger. What did Branch think? "Reeling," he writes, "I played for time by complimenting the president for his quest to devise a practical solution." Inside, he was thinking what you or I would have been thinking. Wowza. Busy with his civil rights trilogy, Branch resisted going on staff with a salary as Clinton first suggested, and eventually the two came up with the idea of recorded interviews on an ad hoc basis. What with being president and all, Clinton didn't get around to having Branch invited back to start the formal interviews for nearly a year and a half. But once they started, they happened with some frequency, and usually--this will not surprise students of Clinton--on the spur of the moment and late at night. Branch reports that he often received calls around six in the evening, beckoning him to appear at the White House around ten that night. Clinton would be in the Solarium, or perhaps the private-residence kitchen, surrounded by briefing papers and crossword puzzles and decks of cards. Sometimes Hillary was present, and sometimes Chelsea, and sometimes Hugh Rodham, and sometimes staffers, or sometimes not. Branch would fire up his tape recorders (two of them), and Clinton would let it rip. North Korea, health care, Saddam, Northern Ireland, elections, this or that unyielding senator, Ken Starr, the press (oh, there's lots of press!) --whatever was in the news and on his mind. It sounds as if it can't help but be fascinating, and on many occasions it is. But in truth it isn't as fascinating as it should be, and the reason rests in the ground rules established by author and subject. Clinton planned to use these tapes for himself--in compiling his post-service memoirs, and for his library. They discussed each keeping a set, but Branch writes that it was he, not Clinton, who suggested that the president keep both copies in his possession. And so every night, when they finished, Branch handed his tapes over to Clinton, who stashed them away. Think about that: they are the very tapes referred to excitedly in the book's title, and Branch had no access to them. He was left to speak into a recording device as he drove home, recreating choice quotes and the general flow of things. These are not the Clinton tapes, they are the Branch tapes. Almost on cue, a Bosnia phone call came through from Secretary of State Christopher. I left the tapes running to record the president's side. No, he kept saying, he did not agree to restore the U.N. sign-off for air strikes. Who said he did? Why would he want to get Boutros-Ghali back in there? Clinton repeatedly assured Christopher that he had not wavered on scrapping the two-key agreement. He said this sabotage must be Chirac.He spun out reasons why they were wrong on fact, substance, and now the politics, because a stronger U.N. role in Bosnia would abet a congressional challenge to his policy. The president hung up, holding his cards, which snapped me out of a reverie that this was extreme multitasking even for him. "That's what it's like," he said, of Bosnia. "Terrible and never-ending." Out of these thoughts, the president expressed more than once a general lesson that leaders need to be at peace--not totally at peace, but roughly united in mind and spirit. He said torment skews judgment. A job like this requires a settled base inside, he kept saying, because decisions every day can offend and hurt people in very large numbers. He continued sporadically on this theme even after we packed up. This pattern of revelations that do not quite reveal--of taking away with one hand what has been given with the other--is repeated throughout The Clinton Tapes. Long paragraphs describe what Clinton said, and then one short quotation follows. Sound recording was not invented for so paltry a payoff. We know that Bill Clinton speaks colorfully and precisely. The promise of his contemporaneous and candid riffs seemed like the whole basis for, and appeal of, this book. But owing to the bizarre ground rules, it's mostly not there. I suppose one understands Clinton's instinct: he wanted to preserve these memories for his own use. But I don't understand why Branch agreed to these terms, and he never explains why. I can imagine Clinton thinking that he may have said something untoward, calling Bashar Al-Assad a shithead or something (as it seems he might have, and not without reason), and wanted it kept from the record. But at the very least Branch could have negotiated an arrangement whereby he could have read through the transcriptions and, with Clinton's consent, used much larger chunks of Clinton's voice than he used. Branch is the reverse-McGinniss: he seems to have gotten so interested in his subject that he surrendered to him to a greater degree than any serious journalist or annalist or historian should have. There are, certainly, some illuminations in The Clinton Tapes, and a mother lode of gratifyingly un-profound ones. (Clinton wanted Gore to choose Barbara Mikulski as his running mate!) One of my favorite stories from the book, one that really pulls back the curtain on the rarefied but bizarre world in which heads of state live, involves Clinton's meeting with then–Chinese premier Jiang Zemin in Seattle in 1993. The two of them sat across from each other at a small table with only their interpreters. Rather than engaging in colloquy with the world's most powerful person, Jiang read studiously from a text "about the glorious history of China and the folly of attempts to influence her internal affairs." On and on he droned. At length, an exasperated Clinton interrupted. Look, he said. I don't want to meddle in your internal affairs. I don't even mind your prisons. I plan on putting more people in ours myself. All you need to do, Clinton confided, is to make a few gestures about human rights, and here are a couple of suggestions. Clinton thought that he had broken the ice. But when he finished, "Jiang simply resumed his speech." The book is substance-heavy (this is good) and covers every imaginable subject. Since Branch knew Jean-Bertrand Aristide previously, there is maybe a little too much Haiti. There is an intense showdown in 1999 between Clinton and Nawaz Sharif over a Kashmir crisis, initiated by Pakistan, that had flared up at the time. Clinton considered an India-Pakistan standoff the most likely flashpoint for nuclear war in the world, and thus the conflict was one of the most important issues on his plate. He tells Branch that at one point during tense Blair House negotiations, he made all aides leave the room: just him and Sharif, eyeball to eyeball, in what he regarded as "his most ferocious encounter in politics--bar none." Around the Sharif talks, Clinton did attend two Women's World Cup soccer matches--this was the year of Mia Hamm's celebrated kick--and then, in quick succession, the funerals of John F. Kennedy Jr. and King Hassan of Morocco. All this while all hell was breaking loose in New York over Hillary's interview in the debut issue of Talk magazine, over which the media accused her of excusing Bill's infidelities because of his childhood traumas. The Clinton Tapes does convey the feeling of what a president's life is like, standing on a moving walkway as it goes faster, faster, and faster, and ducking as the slings and arrows start coming at you. We know a lot about those slings and arrows, but if Bill Clinton's innermost thoughts on the Lewinsky scandal are what you want out of The Clinton Tapes, you will be disappointed. There is a reason for this. Originally, Clinton and Branch both strove to keep these conversations secret. But inevitably word of them got around, the implication of which was that they might be subpoenaed. The tapes weren't, but because his name appeared regularly in White House visitor logs, Branch himself was subpoenaed by Al D'Amato's Senate Banking Committee. FBI agents visited Branch's home in 1996 and grilled him about whether he had ever seen some legal billing records or anything that might have resembled them. For these kinds of reasons, Branch writes, Clinton did not dwell much on tape about the substance of any of these salacious matters. Branch began this project skeptically, feeling that since their days together in Texas he had taken the path of integrity, while Clinton had sold himself to a world of corruption and compromise. By the book's end, he has reversed this view. His identification with Clinton's opinions, especially about the media and Whitewater and Lewinsky, is thorough. Branch makes no pretense of being objective and detached. Indeed, in the last chapter, he discloses that, after Clinton was out of office and had made some money, the former president gave him a check for $50,000 for his services over the years. Despite some hesitation, on the grounds that he regarded the project "as a public service," Branch accepted the check, because he "did need the money." It is depressing to think that one of America's greatest journalist-historians needed the money. Inasmuch as the tapes helped Clinton write My Life, Branch certainly rendered the president a service that had a fair market value. But the nature of the transaction--undiscussed, delivered as a kind of largesse from above rather than as an agreed-upon payment--is just one more odd detail in the story of a relationship between a fine writer and an important subject in which the subject had more control over the project than the writer did. A journalist, even one as formidable as Taylor Branch, cannot wrestle history with a president (as the subtitle has it) and win, especially when the journalist gives the president the source material. The Clinton Tapes is less illuminating than it could have been, and more disturbing than it should have been.